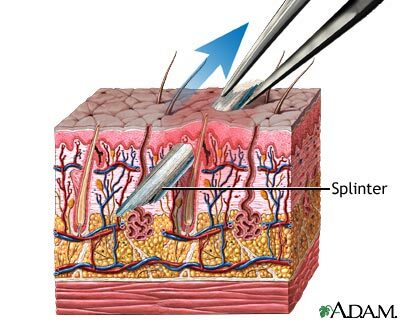 A splinter is a thin piece of material (like wood, glass, or metal) that gets embedded just below the top layer of your skin. To remove a splinter, first wash your hands with soap and water. Use tweezers to grab the splinter. Carefully pull it out at the same angle it went in. Sterilize a pin or needle by soaking it in rubbing alcohol or placing the tip in a flame. 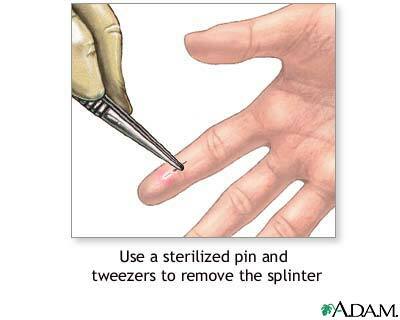 Use the pin to gently remove skin over the splinter. You may need to use a tweezers to pull out the splinter after you lift it. After the splinter is out, wash the area with soap and water. Pat the area dry. (Don't rub.) Apply antibiotic ointment. Bandage the cut if it is likely to get dirty. See your health care provider if there is inflammation or pus, or if the splinter is deeply embedded. Also, seek medical attention if the splinter is in your eye or close to it. Auerbach PS. Procedures. In: Auerbach PS, ed. Medicine for the Outdoors. 6th ed. Philadelphia, PA: Elsevier; 2016:444-445. O'Connor AM, Canares TL. Foreign-body removal. In: Olympia RP, O'Neill RM, Silvis ML, eds. Urgent Care Medicine Secrets. Philadelphia, PA: Elsevier; 2018:chap 48.